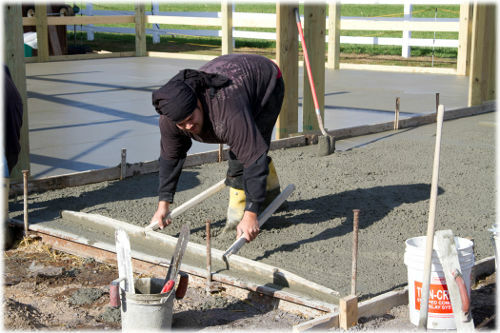 For pole barns used as a garage, implement storage farm buildings, and many other uses, a concrete floor is a great addition. Dirt and gravel floors are cheap but they are also hard to keep clean and maintain. Dirt and gravel floors are subject to erosion when drainage is a concern for your site location. Since there are no foundation walls in a pole building a floating slab can be poured inside the poles using the skirt board for forms. The concrete is considered to float because it is totally independent of the building. Changes in temperature and ground movement allow shifting of the foundation with no impact on the poles that support the structure. A 1" foam expansion joint is placed around the perimeter of the foundation to isolate it from the wall framing of the building. To calculate footer only set post to 'None'. We are not suggesting you fill your hole with concrete (although some counties do). This is for bottom cookie and footer calculations. See the post embedment techniques page for more info. Add both together for hole requirement.